The first pages held photos of the group of them, in various poses and locales. They were labelled on the borders, “The Gang at Montauk” or “The Gang at Provincetown.” “The Gang”, it appeared, travelled a lot. Then there were the winter season shots, The Gang members in fur-trimmed coats with cloche hats pulled tightly down to their eyes, which peered out at me seductively. None of the group pictures were labelled with names, and I felt cheated. I turned the pages more quickly, till I came to a section devoted to Harriet. Harriet in a high-necked white lace blouse, in the purity of girlhood. Harriet in a low-waisted mesh dress that just grazed her knees. Harriet close up, in a hat that covered one eye and left the other beckoning. observations: It’s hard to categorize Out of Time. A modern woman finds some old photos and starts researching the lives of a group of women in the 1920s, while trying to work out issues in her own life. Nothing surprising there – but then the ghosts of the earlier women start interfering in her life. Out of Time won awards on first publication and should have been the start of something big for Paula Martinac. But it wasn't, though it has kept its place in the hearts of readers. Women love it – finding it in small secondhand shops (which is very appropriate to the content of the book) or buying new editions: Bywater Books have made it available again. Martinac apparently now works as a nutritrionist, and is still producing journalism. The story is charming. and very readable,and memorable: and it’s not surprising that it has its own life despite years of neglect - and of course Clothes in Books loves the importance and respect given to old photos in the book. It has a strong gay sensibility, and is informative about the history of gay women in the USA in the first half of the 20th century. It’s also fascinating about the silent movie business. to film, and that were called “daily changes,” a term that meant they played only one day in each town. It was not glamorous for the actors, and the plots were worse than many of the regional theater plays Harriet had appeared in. With thanks to culture writer June Thomas (@junethomas) for extra info. Links on the blog: Young actresses making their way in the UK in a similar era, and a very beautiful silent movie star, who could have been Harriet, here (from the State Library of New South Wales). 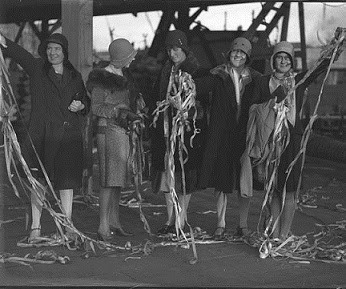 The group picture of the women is from 1927, and is from the Australian Maritime Museum. 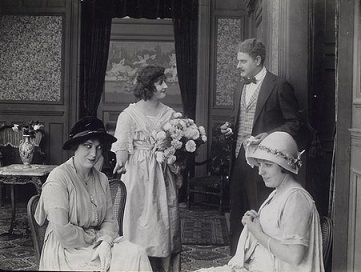 The still from a silent movie is from the NY Public Library. My husband was quite taken with the photo of the silent movie star. He likes both silent movies and photography. The book sounds very interesting. Moira - You had me right away with the old 'photos. This sort of plot doesn't normally appeal to me, but honestly, the mystery of old 'photos does. Interesting and I'm glad you found it enjoyable. Will look for this one!